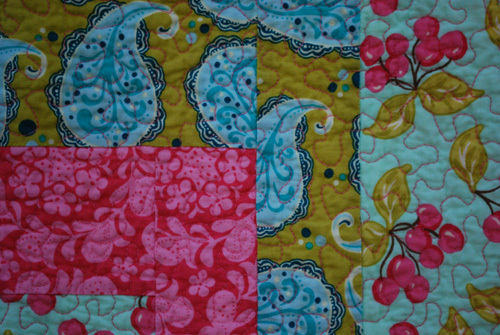 I love how this quilt turned out…so cheerful and fun. It shrunk A LOT in the wash–a whole 5 inches! 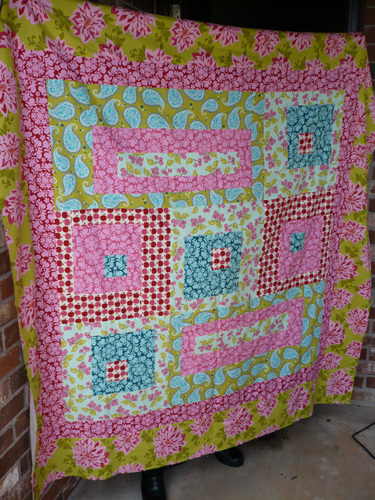 With all the quilting it is a bit stiff, but that’s fine with me because I absolutely love it! For best viewing results use Firefox (internet explorer is having issues with wordpress…if anyone knows how to fix the problem, please let me know. problem: pictures aren’t centered in ie). Even though it took me a very long time to quilt, I do love how it turned out. Anyway, now it’s on to the binding. I now have the binding attached to the front, and now I need to hand stitch the binding to the back. I haven’t had a whole lot of motivation to do this (perhaps because it took so long to quilt), but hopefully I can get the binding done soon, because I absolutely love this quilt! Quilting the Rocqua Rhthym quilt top is taking a very long time and a lot of thread. I chose pink thread as it blends really nicely with all the colors. Ethan, my five-year-old, said “Mommy, the pink thread doesn’t look good on the green color fabric.” But I think it looks really nice. And now for the Rocqua Rhythm sandwich. It’s pin basted and ready to quilt. But there is no time to quilt this weekend since today is my little princess’ 4th birthday, and we have a weekend of birthday festivities. 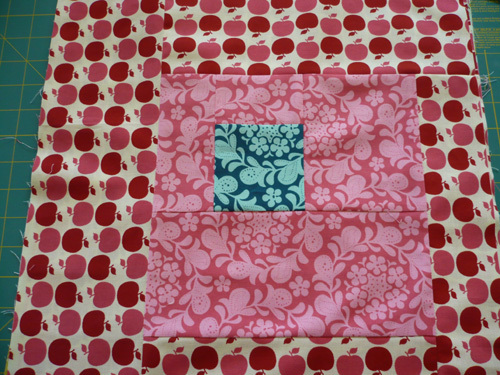 This quilt is pretty big measuring in at a 65″ square, so I’m guessing it will take me quite some to quilt this one. One unexpected surprise from our new earlier mornings since Ethan started kindergarten is that Ellie, who was once phasing naps out, definitely needs a midday rest. What does all this mean? I have found that I now have 1 to 2 hours of time during the day all to myself! And guess what I decided to do with that time? 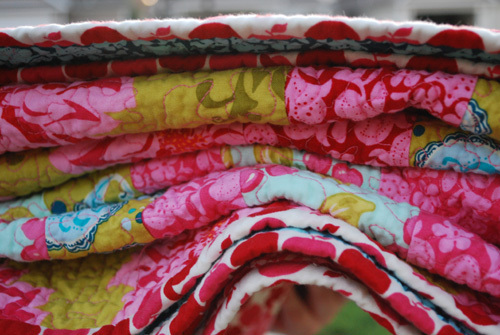 Quilt…shocking I know! 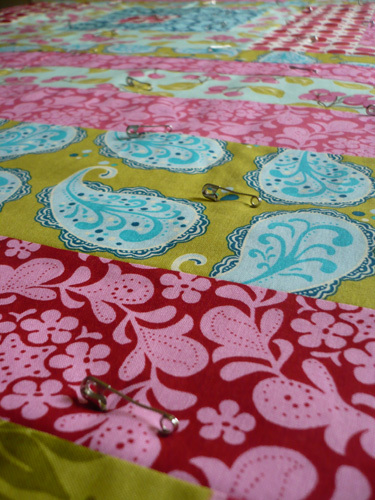 On Wednesday I had the creative itch during this new found time, and I sewed up the back for the Rocqua Rhythm quilt. I designed the back, and I just love it! It’s kind of a large modified log cabin. When I originally bought fabric for the back my intention was to just use the turquoise and the white with pink flowers. After I finished the top and laid out the backing fabric, I felt the back needed some more punch and pizazz. 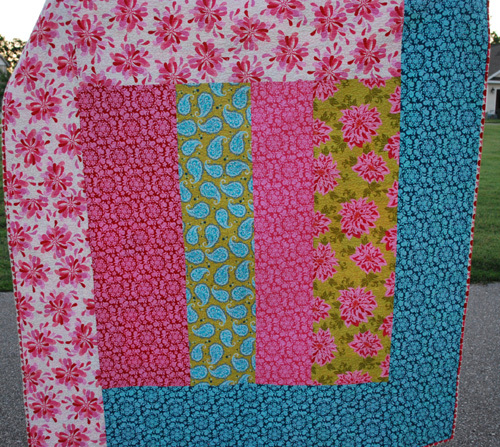 So, I played around with the leftover fabrics from the quilt top and the turquoise and white with pink flowers until I found an arrangement I liked. I really do love how it turned out…in fact, I like the back as much as the front! 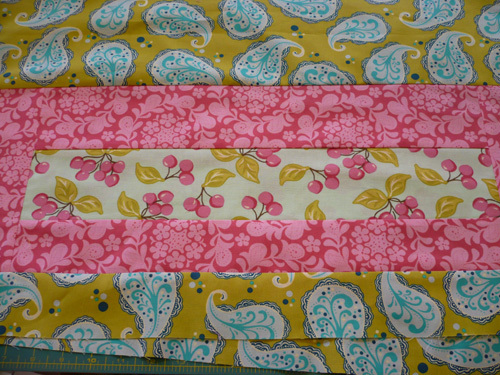 The binding is going to be the apples from the quilt top. I got my Rocqua Rhythm quilt top done today. 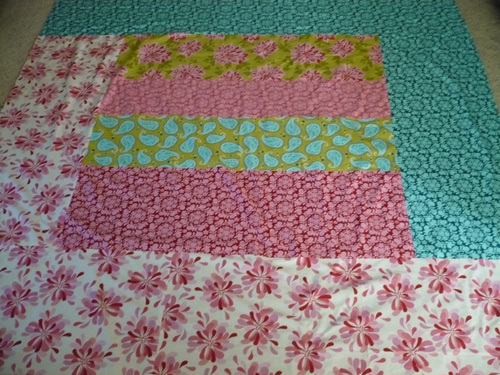 The fabric is Farmer’s Market by Sandi Henderson for Michael Miller, and the pattern is Cubic Rhythm from the Spring 2009 issue of Quilts and More. 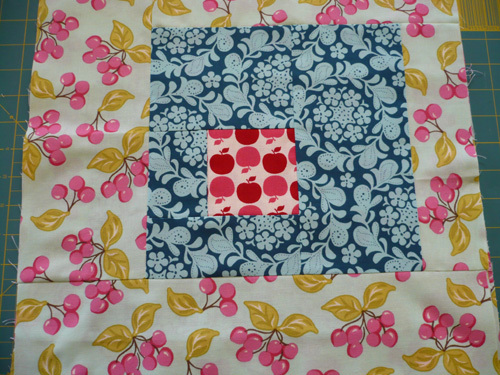 It’s bright and cheery, although I do wish that I had made 3 blocks of the cherries and put those on the diagonal…note to self, need to get a design wall set up. 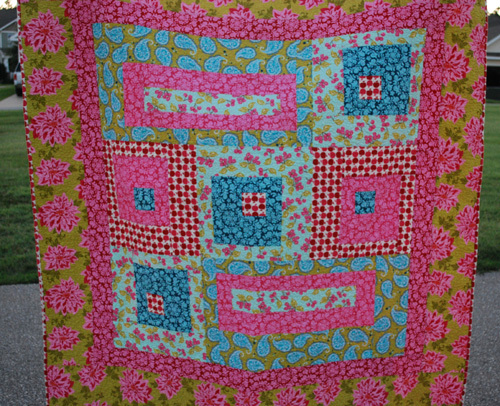 I still think it looks great and is the type of quilt to put a smile on your face. 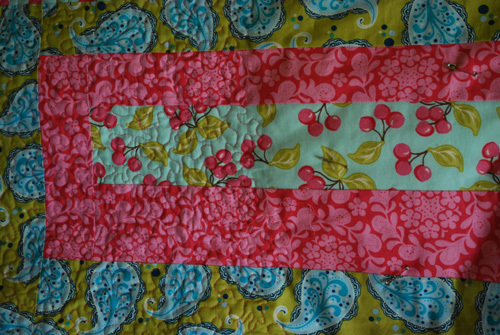 Now I just need to piece the backing and I will put this one in the cue to get quilted. Now I need to sew the blocks together and sew the borders on. 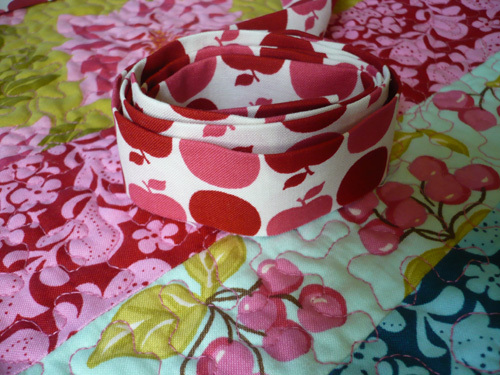 I’ve been itching to use this fabric ever since I bought it a few months ago. I keep meaning to get started, but every evening something seems to come up. Hopefully tonight I’ll be able to cut the fabric. Love, love, love Sandi Henderson’s Farmer’s Market line.